At the Target step of the wizard, define the target backup repository for the backup copy job and retention policy settings. 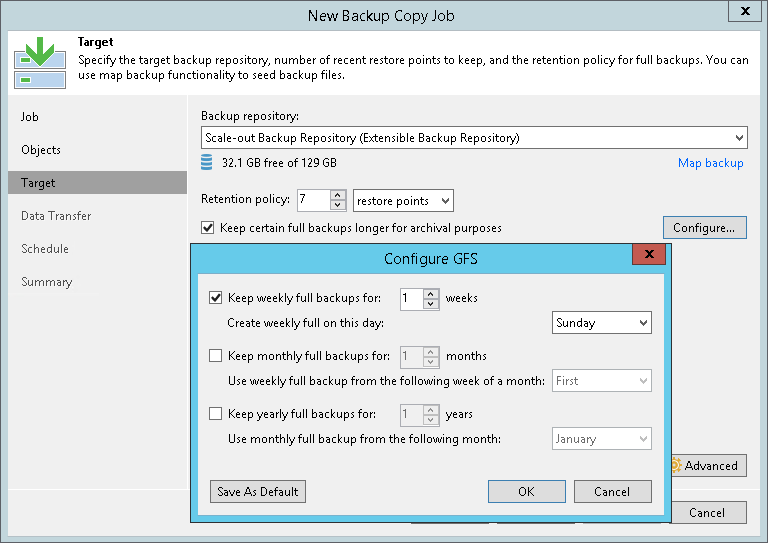 From the Backup repository list, select a backup repository in the target site where copied backups must be stored. When you select a target backup repository, Veeam Backup & Replication automatically checks how much free space is available on it. Make sure that you have enough free space to store copied backups. In the Restore points to keep field, specify the number of restore points that must be retained on the target backup repository. When this number is exceeded, Veeam Backup & Replication will remove the earliest restore point from the backup chain. The maximum number of restore points for the backup copy job is 999. For more information, see Simple Retention Policy. To use the GFS (Grandfather-Father-Son) retention scheme, select the Keep the following restore points as full backups for archival purposes check box. In the fields below, specify the number of daily, weekly, monthly, quarterly and yearly full intervals for which backups must be retained. Use the Schedule button to define the schedule by which GFS full backups must be created. For more information, see GFS Retention Policy. If you do not want Veeam Backup & Replication to synthesize archive backup files on the target backup repository, select the Read the entire restore point from source backup instead of synthesizing it from increments check box. Veeam Backup & Replication will transport data for archive full backups from restore points from the source backup repository to the target backup repository over the network. The load on the network will be higher but the performance of the target backup repository will increase. For more information, see Methods for Archive Backups Creation. You cannot enable GFS retention settings if you use a backup repository with rotated drives as the target backup repository.